By Peter Anderson 7 Comments - The content of this website often contains affiliate links and I may be compensated if you buy through those links (at no cost to you!). Learn more about how we make money. Last edited January 31, 2014 . Last year I was considering going to a CPA because my tax situation was becoming more complicated, with the side income I was reporting from the blog. After looking into it, however, and procrastinating until the last minute, I ended up deciding to use the Deluxe version of the TurboTax software because April 15th was coming up quicker than I was ready for. In the end I was happy with the product and how easy it was to use, and I think I'll probably be using it again this year. If you file your own taxes I suggest using e-file to file your taxes as your tax return is processed a lot faster than if you send in a paper tax return. You can also get a refund in as little as 8 days with e-file, but it can take a month or more to receive a refund via check. Plus, if you met certain income restrictions in 2010, you can file your federal taxes for free! If you are looking for an affordable option to e-file your taxes, there are several places that will allow you to do it for free, if you meet certain conditions. The IRS has a Free File program that allows you work with a number of tax preparation software companies in order to get free tax preparation if you had an adjusted gross income (AGI) of $58,000 or less in 2010. Some of the companies will have a lower AGI threshold than others, but in general most will offer free e-file along with having a free tax preparation option. If you're looking to file your taxes for free, here are a few of the free filing options. Remember the required maximum AGI for free filing will vary from company to company. Click on the company name to start your free return! Last Edited: 31st January 2014 The content of biblemoneymatters.com is for general information purposes only and does not constitute professional advice. Visitors to biblemoneymatters.com should not act upon the content or information without first seeking appropriate professional advice. In accordance with the latest FTC guidelines, we declare that we have a financial relationship with every company mentioned on this site. And then they charge you an arm and a leg for state filing. This year, I’m going to go with TaxAct. They have the best prices by far ($17.95 for deluxe version, both state and fed) and have gotten good reviews. I’ve been turned off this year by how much Turbo Tax costs. @Mark, that has been my experience, as well. In the past I’ve used the free version of TaxAct (the free version has no income limit cap). 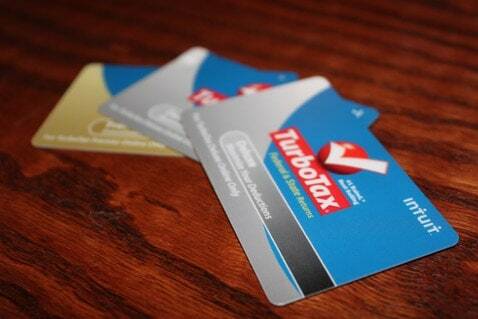 But this year, I’ll have to decide between the deluxe version of TaxAct or Turbo Tax. I was even considering going to an accountant, but based your article, I think I will check out the software packages first. Yeah, don’t get me wrong – some people would benefit from going to an CPA to get their taxes done, regardless of the added expense, yet I’m just not convinced I need to yet as I’m so immersed in this stuff from writing about it all the time, and my tax situation isn’t overly complicated. For the last two years, we have qualified to use FreeTaxUSA and I have been pleased. Last year we got a credit that I had not known existed. The first year we used it, I did our state taxes on paper. Last year, I paid to e-file and it was much less time consuming and well worth the cost. Previous Post: Is Netflix A Cost Efficient Entertainment Option For You?